Photographer Greg Diesel Walck captured this photo of Jupiter near the moon from the coasts of North Carolina on Jan. 21, 2013 during an extreme close encounter. A night sky meeting of Jupiter and the moon, called a conjunction, amazed skywatchers around the world last night (Jan. 21). The waxing gibbous moon and Jupiter — the two brightest objects in last night's sky — appeared to be almost touching for part of the night before the moon crept below and past the gas giant, continuing on in its orbit. "One of the most challenging things I've ever shot," Greg Diesel Walck in North Carolina wrote in an email. "Had to strap my tripod onto a pole so that it could be tilted back so far and duck tape my zoom lens so it would stay fully zoomed! Also a very windy night as a cold front moves into N.C. making for tricky long exposures." 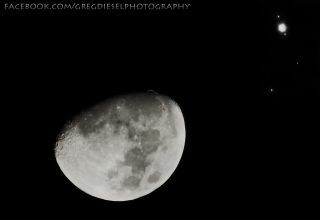 Skywatcher Greg Wigler captured this photo of Jupiter near the moon on Jan. 21, 2013 during an extreme close encounter. The image also shows two Jovian moons and a star. Weather was an issue for some observers, too. "Snow flurries were rushing in from the northwest, so I had to wait to get shots between the clouds," Eric Teske of Bowling Green, Ohio wrote to SPACE.com. "When the clouds parted, I was able to grab two photos for a clean composite. I was out for about 20 minutes total and couldn't feel my fingers as I was packing up my gear and rushing back into my apartment!" Skywatcher Eric Teske captured this photo of Jupiter near the moon on Jan. 21, 2013 during an extreme close encounter from Bowling Green, Ohio. Some readers were caught by surprise when they looked up at the sky last night. "I just went outside tonight to take a look at the stars," wrote Barbara Ash of Ridgecrest, Calif., "and saw an object in conjunction with the moon. I ran back in and grabbed my tripod and camera, and took some amateur shots." And the sight wowed beyond North America, too. Skywatcher Apple Lily captured this photo of Jupiter near the moon on Jan. 21, 2013 during an extreme close encounter from Trinidad and Tobago. "Partly cloudy evening and night here in central Italy, but the conjunction show was still captivating," Giuseppe Petricca wrote. "They are close!" Christiane Lisboa wrote from Brazil. In case you missed it, yesterday's conjunction won't be the last time Jupiter and the moon have a seemingly close encounter. On March 17, the two heavenly bodies will appear in the same part of the sky again. Editor's Note: If you took a photo of last night's close conjunction of the moon and Jupiter that you'd like to share with SPACE.com for a possible story or gallery, please send it, along with your comments, to spacephotos@space.com.